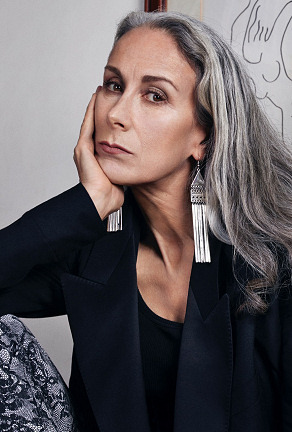 Former Fashion Editor and Co-editor of i-D Magazine and Broadcaster for 15 years, Caryn Franklin, has explored the politics of image and self-esteem extensively in over 30 years of working fashion practice in commercial, educational and activist positions. Caryn has recently completed and MSc in applied psychology. Her projects have involved refugees in battle zones, workers in free-trade-zone slums, mental health experts, MP's and Gov. Ministers as well as international design names and the fashion industry’s innovators. Her drive to empower men and women by addressing sustainable body and beauty ideals as an ethical imperative continues through her post at Kingston University, where she is visiting professor of Diversity. Caryn is also Education Director at Clothes Show Live and a regular contributor to i-D online. She has recently collaborated with i-D to create a new section entitled Cool Psychology. Former i-D Magazine fashion editor and co-editor for 6 years and BBC Broadcaster for 12 years presenting and directing The Clothes Show, Caryn has always been interested in the politics of image and self-esteem as well as straight fashion. She's interviewed everyone from Yves Saint Laurent to Georgio Armani and created televised tributes at the V&A for ITV featuring Vivienne Westwood and Philip Treacy amongst others. She has authored and co-produced numerous fashion programmes and documentaries for BBC 1, Channel 4, ITV, Discovery, Granada and UKTV Style and has written for a host of national publications and produced 4 books. Education has featured throughout her career. An external assessor, course validator and lecturer in colleges like Central St Martins, London College of Fashion and Royal College of Art, Caryn has an honorary Doctorate from Kingston University, is an Honorary Fellow at the Arts University College of Bournemouth and a Visiting Fellow at London College of Fashion. She is an ambassador for the London College of Fashion's Centre of Sustainability and has helped create the Diversity Network at Edinburgh College of Art. She is also the education ambassador for the UK's premier fashion consumer-show Clothes Show Live, a brand she has worked with since its beginning 22 years ago. She has co-chaired award-winning Fashion Targets Breast Cancer, for 17 years and since 2009 has dedicated her time to fashion activism, co-founding the award-winning All Walks Beyond the Catwalk, to promote sustainable body and beauty ideals and emotionally considerate practice. This initiative has changed university curriculums, and reaches internationally, engaging with institutions in Canada and Australia. Increasingly Caryn is called upon to debate and deconstruct fashion for a variety of audiences. She has given after-dinner speeches, mentoring presentations and chaired panels for brands as diverse as Meryll Lynch, Wella, Oxfam, Graduate Fashion Week, National Portrait Gallery, Cambridge Debate, SHOWstudio and the V&A Museum.